Authors: Khush Agarwal, Isha Setia, Dhritika Dhawan, Harashavardhini Pareek, Aditya Agarwal, Isha Rautela, Shivangi Singh. 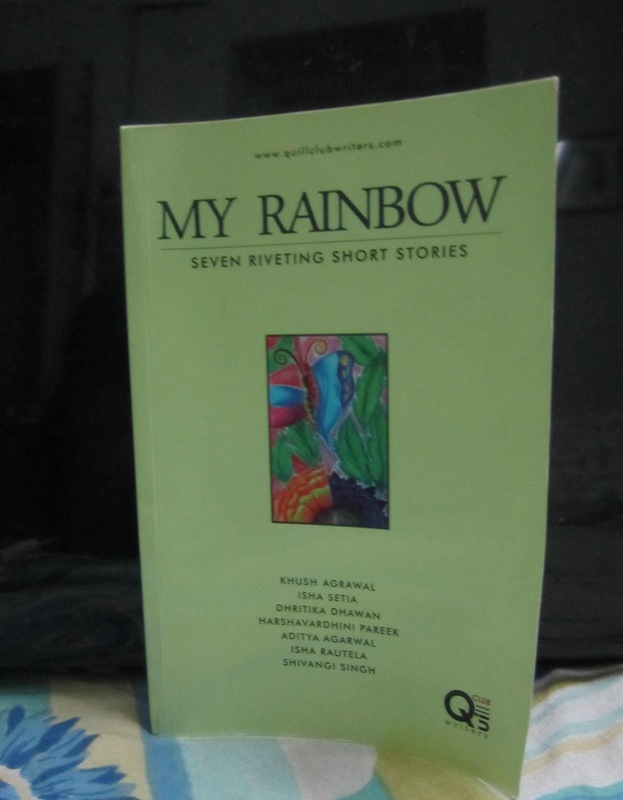 When I first asked to review My Rainbow, I had no idea that the seven short stories were actually penned by school students. The back cover write-up hinted that this would be a very promising read. Along with the book, I was sent clippings from a newspaper where I learned more about these seven delightful young authors. To be honest the stories in books are riddled with spelling mistakes, tense mistakes and there even have been instances of malapropism. But as I write my review, I will overlook these errors...because we have to keep in mind these were children writing the stories. That they are able to think of plots and go on writing without getting bored, is very commendable. The editors should have helped out the kids. I know from experience how painful it is to proofread your own stories. Once you've finished a work, it feels like you conquered something and it's a lot of effort to go back fix the little details. The kids should be spared of such criticism, instead the focus ought to be on the stories they thought up. 01. 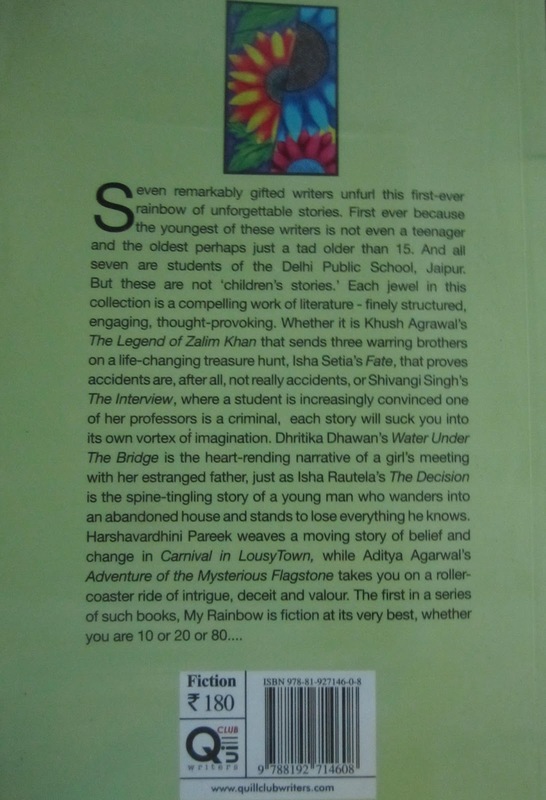 The Legend of Zalim Khan by Khush Agarwal: I was actually impressed by the way Khush thought out the story. Nothing really happens, but it's a wonderful read on its own. I liked the way he build the back story and merged it with the present. It was interesting, yes. And I can see we're going to get better stories from him, when he grows up. 02. 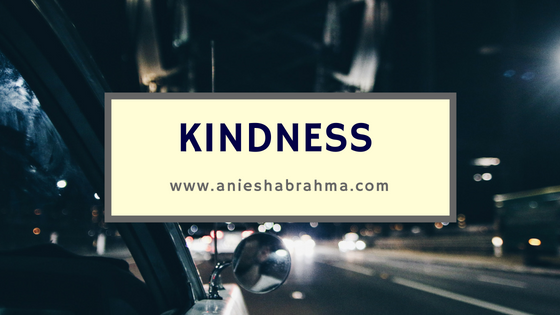 Water Under the Bridge by Dhritika Dhawan: A thirteen year old whose able to write about the estranged relationship with a father and daughter, is mighty impressive. An old cliched plot: where the father leaves in search of riches and never comes looking for his family....the girl goes to meet him in the end. It was a little predictable, a story simply told. Nothing too fancy. A sweet read. 03. Carnival in Lousytown by Harshavardhini Pareek: The little authoress herself claims to be a fan of R.L. Stine and I can see that admiration reflected in her writing. The entire descriptions of the town and its folks seemed like something out of those Goosebumps novels I loved to read as a kid...it's another story where everyone is waiting for something to happen, and while they wait, they make the best use of their time. It was another very cute story. 04. Fate by Isha Setia: Isha digs into our past...nacchnewalis and the fate they had suffered. She takes us through the story of the grandchild of a such a woman, and how the child battles with her fate and would she emerge victorious in the end? It reads a little stiff, but it's a pleasant read nevertheless. 05. The Interview by Shivangi Singh: I have to applaud Shivangi's imagination. Writing about a college lecture scene, and forming a story through glimpses of memory really requires talent. A young college girl remembers her professor as a conman when she was little, and she proceeds to interview him one afternoon, when they are playacting. I loved the vivid tale Shivangi came up with. 06. 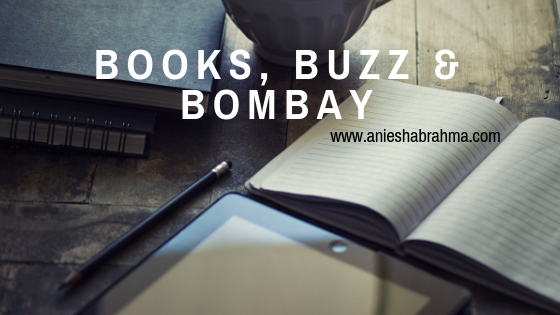 The Decision by Isha Rautela: This short story I liked for being different run-of-the-mill kinds that I had read, but unfortunately the twist Isha puts in the end guarantees just that. Yash as a protagonist had tremendous potential, I really fail to understand why Isha chose the cliched ending. She seems like a super intelligent kid, and I hoping her next stories will not have such a disappointing end. 07. Adventure of the Mysterious Flagstone by Aditya Agarwal: I think Mr. Agarwal is a fan of Enid Blyton. The story read like one of the Famous Five adventures, I found it really sweet read. He was gunning for something more serious, I am sure. But given his age, I understand why he got influenced by the adventure stories. There were some grammar errors, but the plot was really good. I want to congratulate each of these seven children. They have shown promise in the work. I wish their works had been better edited though. In future, I look forward to reading more of their stories. Good luck! Lovely review Aniesha. I loved the fact that you actually understood the shortcomings that these kids must have faced and kept a neutral view. It is truly a downer when editors don't do a good job but I suppose doing major changes in their stories might have ruined their childish fervour but well, grammatical errors could've been avoided. It is really amazing how kids so young can come up with such tales. Yeah, if I was harsh try googling the other reviews these kids got :) It's not their fault...they are in need of better editors!